The System 6 software is a popular choice for Motorola 68000 based Macs, or Macs with only 1MB RAM. 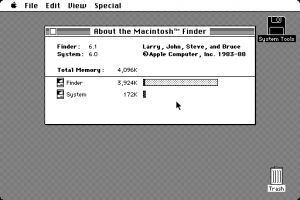 You can also find a bootable copy of System 6 hidden in the ROM of the Macintosh Classic. Released in 1990. This version of the System Software shipped with the Macintosh IIfx. Released in 1991. System Software 6.0.8 is the System 7 printer-compatible version of system 6. This release is identical to system 6.0.7 but comes configured with the System 7 printing software so that System 6 and System 7 Macintosh computers can share the same LaserWriter in a compatible way. It contains no new features or bug fixes. Apple is releasing system 6.0.8 to provide an easy, system 7 printer compatible release of System 6 software so that users are automatically able to share printers across the network with users of system 7.